Chicago was a milestone for Glti.ch Karaoke : we broke the two-locations-at-a-time barrier! Squeezing more pop tunes and more bytes of data to more Karaoke singers than Cephalopods have limbs. Many thanks and general claps of gratitude must go to Mike, of the superb and inspiring fyidisco, who rocked his very own microphone and webcam from his West London flat. 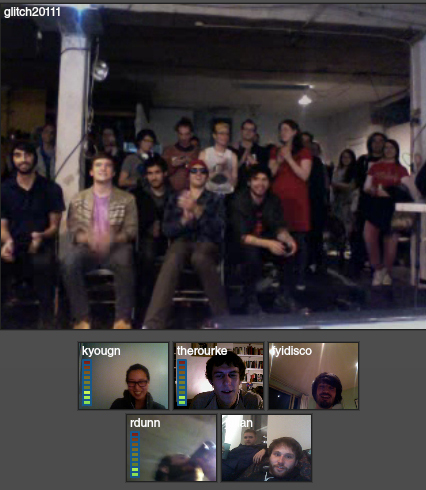 Also, all the people who logged on to our TinyChat and Google+ pages via browser, smartphone or Astral Projection. On Friday night our second outing for the wonderful Gli.tc/h 20111 Festival takes place in AMSTERDAM: at PlanetArt. I (Daniel) will be there in person, convincing every Dutch person I meet to duet Barry Manilow with me and my online bretheren. #1 collaborator and primary glitcher Kyougn will taunt London with her magnificent lungs, Sam Meech will no doubt roll up his singing sleeves for Liverpool. How can you join us on Friday? With both these windows open on your computer, a webcam, a microphone and some speakers you too can Glti.ch Karaoke! Invite your friends around, force beer down their gullets, dress them up in clothes indicative of an era of pop from well before their time.